Part of me feels great having had predicted this summer that oil prices, then in the mid-$40 a barrel range, were due to rise in a big way. But there’s something to look out for while we watch oil break out toward $60 and perhaps higher. We may reap the windfall now, but the rise in oil prices could be planting the seeds of the next bear market in stocks. It’s all about consumer spending and the almost $13 trillion “elephant in the room” — better known by the Federal Reserve Bank of New York as Americans’ total amount of housing and nonhousing debt. 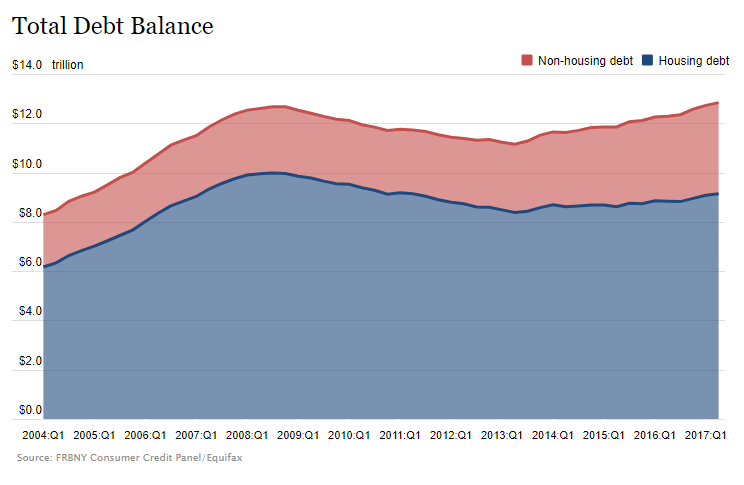 Every quarter, the Fed tabs up what it calls the nation’s “total debt balance” — mortgage debt plus nonhousing debt (loans for automobiles, credit cards, home equity and student loans). At the last peak in the economy, in 2008, the nation’s total debt balance tapped out at $12.68 trillion. We surpassed that milestone back in the first quarter of the year, when Americans’ accumulated an aggregate $12.72 trillion that needs to be paid back. It grew to yet another new record of $12.84 trillion in the second quarter. But what’s so interesting (and dangerous) is that it’s not mortgage debt, but all the nonhousing debt that’s leading the charge higher in the statistics this time. Back in 2008, all those other kinds of loans made up about 21% of Americans’ total debt balance. Today, the aggregate of financing our cars, college and credit cards makes up nearly 30% ($3.7 trillion as of the second quarter, according to the Fed). That’s why the newly rising price of oil is a big deal for the stock market. If you believe the surveys that say 62% of Americans have less than $1,000 in their savings accounts … what does that tell you about their ability to absorb the additional cost of gasoline for their vehicles — without missing a payment on a credit/student/equity/personal loan of some kind? When oil was above $100, the price of a gasoline futures contract was about $3 per gallon. As recently as this summer, it was half that price. But it has now climbed to $1.80 a gallon. What happens when it climbs to $2 or $2.25 a gallon in step with rising oil prices and the economy? It’s that much less money that Americans have to spend on all the other stuff that makes the economy move — and underpins the rise in stock prices. So let’s say you’re concerned about that possibility. What can you do about it? Fortunately, there are exchange-traded funds (ETFs) that give you options. One possibility is the ProShares Short S&P 500 ETF (NYSE: SH). Like just about anything with a bearish tint in recent quarters, it’s been a one-way ticket to lose money. That’s always the case — until it’s not.